Mention Mardi Gras and most folks envision a pre-Lenten party in New Orleans or Rio de Janeiro, with brightly colored costumes and strings of beads. 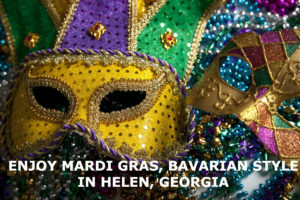 But in the mountains of Northeast Georgia, the celebration takes on a decidedly Bavarian touch as Helen celebrates its 50th Fashing celebration, February 16, 2019. Fashing is what Mardi Gras season is called in Germany, and traditionally it begins on the 11th day of the 11th month at 11 minutes after 11:00 a.m. The festivals occur mostly in the Rhineland area and go back to a time when leaders ruled with iron fists. Fashing celebrations gave common folks license to misbehave, dance in the streets, have masquerade balls, and basically just get rowdy. Here in Helen, the celebration is a bit tamer but no less fun! While festive costumes are encouraged, they are not required for participation. Local Fashing festivities actually kick off on Saturday, February 2, with a Pub Crawl and Scavenger Hunt, followed by a Fashing party at Hofbrahaus restaurant. One week later, on the 9th, there will be the Fashingsverein River Parade, highlighted by legions of inner tubes floating down the river. These two events are a buildup to the main Mardi Gras celebration on February 16. This year’s theme is “Anything Goes,” giving free range for costume ideas. Prizes will be awarded for best overall, best female and best male costumes. The fun evening includes music, dancing and a full bar. And maybe just a bit of harmless rowdiness. Come celebrate in the mountains this winter, stay at Lucille’s Mountaintop Inn & Spa, and take advantage of Lucille’s Winter Romance Package. Available now through March 31, 2019, it includes massages for two, breakfast in bed, chocolate covered strawberries and champagne or sparkling cider. Call today for information, or book a stay online! This entry was posted in Georgia Mountain Inn Special, Georgia Mountain town, Georgian Mountain Festival, Music event and tagged Festival, Georgia Bed and Breakfast, Georgia Mountain Activities, North Georgia B&B, Packages, Romantic Inns by admin. Bookmark the permalink.